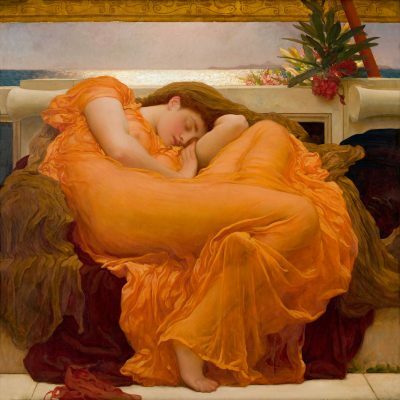 Frederic Leighton was an English painter and sculptor born in Scarborough, England in 1830. He studied at the University College School in London. He travelled and studied in Germany, Italy and France. In 1848 he settled in Paris where he met Delacroix and Millet. Belonged to the group of the Pre-Raphaelites and the so-called group of Olympians, for their love of Greek art. Leighton had a dizzying career, was appointed a member of the Royal Academy of Arts in London, of which he became president. He was named baronet and baron of Stretton. He died in London in 1896, his house in Holland Park, was transformed into a museum, the Leighton House Museum.